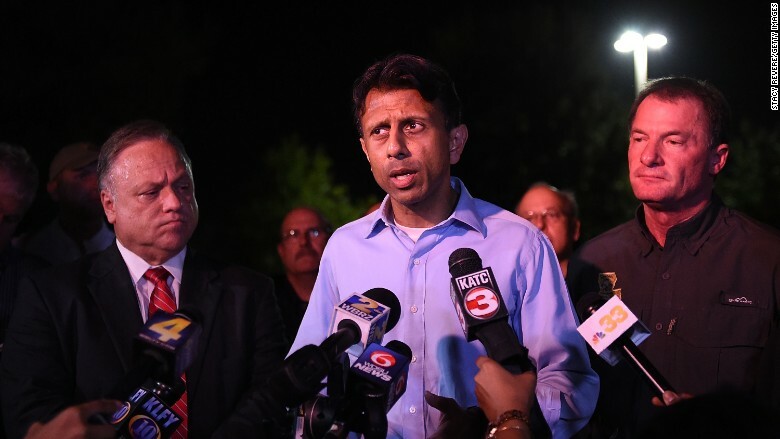 Louisiana Governor Bobby Jindal speaks to the media near the Grand Theatre. At the movies, feelings of fear and terror are supposed to come from the big screen and the blasting speakers. But on Thursday a real-life burst of violence interrupted a 7:00 p.m. showing of "Trainwreck" in Lafayette, Louisiana. Gunfire killed two moviegoers and injured seven others. The gunmen died of an apparent suicide. The incident is sure to renew questions about movie theater security and what responsibility theater owners have to ensure the safety of moviegoers. In the wake of the massacre at an Aurora, Colorado theater in 2012, security measures were stepped up at some cinemas. But the steps that were taken -- more guards in some cases -- were mostly unpublicized. Maybe what's notable is what didn't change. Ticket sales didn't slump. American film buffs were undeterred. Theaters across the United States fundamentally remain freewheeling places, where ticket-holders can wander in and out, unbothered by the intense security measures that now typify airports and public buildings. It is hard, and sad, to imagine metal detectors and bag scanning machines in the lobby of the local multiplex. The shooting on Thursday occurred at the Grand 16 theater complex, which is owned by Southern Theatres, a chain that is based in New Orleans. Keifer Sanders, who was at the theater, estimated that about 100 people were there for the "Trainwreck" screening. The well-reviewed comedy starring Amy Schumer debuted last weekend. "My heart is broken and all my thoughts and prayers are with everyone in Louisiana," Schumer wrote on Twitter after learning of the shooting. The distributor of the film, Universal, declined to comment Thursday night. So did a spokesman for the National Association of Theater Owners, which represents all the big chains, like AMC and Regal. Darkened theaters are statistically safe places to spend time. People enjoy movies, in part, based on the confidence that they're safe and secure in their seat, able to relax and get absorbed in the story that's unfolding on the screen. That's why it is especially horrifying to hear of violence in a theater -- because it's a place people associate with escapism and entertainment. One witness, Jalen Fernell, told CNN's Don Lemon that when he heard gunshots, "I almost thought it was part of the movie at first." Some witnesses said similar things when gunfire erupted in Aurora at a midnight screening of "The Dark Knight Rises" on July 20, 2012. Last week a jury found James Holmes guilty on 24 counts of murder for the killing spree. There was immediate speculation on Thursday night that the Lafayette shooting could be a copycat crime, given the news coverage of the recent Aurora verdict, but no evidence that it actually was. In the wake of the Aurora massacre, there are multiple lawsuits against the theater owner, Cinemark, winding through the courts. According to The Denver Post, there are May 2016 and July 2016 trial dates for some of the civil suits, which generally allege that Cinemark had inadequate security. If that's one area of debate that arises from the Layafette shooting, another area of debate will be around the prevalence of guns. Sandy Phillips, whose daughter Jessica Redfield was killed at the Aurora theater, wrote on Twitter when she heard bout the new shooting, "Here we go again America. THIS is freedom?" Schumer, who wrote "Trainwreck," as well as starred in it, said nothing about the political context of the theater shooting, and the movie's director, Judd Apatow, did not immediately weigh in via social media. But Apatow's views on the subject are well known: he was the main speaker at a gun violence prevention fundraiser in Los Angeles in February. "Responsible gun laws are essential," he said at the event, Deadline.com reported. "It's shocking that even after all the mass shootings that have happened that there isn't more being done to make our country safer."